Why, When & How to clean solar panels? Knowing how to clean solar panels is one of the most commonly asked questions. This article goes over the basics and importance of cleaning solar panels for residential solar PV systems. When it comes to keeping your solar panels clean, one must know why, how and how often? Why keep solar panels clean? The first question can be answered in a fairly straightforward manner: to improve energy output. Like shading, dirt and other things blocking your solar panels from the sun can drastically reduce your energy output. As for the numbers, the Solar Electric Power Association (SEPA) states that energy output can be decreased by about 10% due to dirt and other residues. In areas with more bird dropping, pollution, or dust, the efficiency can decrease as high as 15-20%. So in order to get the energy output that you paid for, you need to cleaning now and then. How do I clean solar panels? The most economical way for domestic systems is to clean them manually. There are some factors to think about before you take some soap and hose your solar panels down. If you are thinking about the convenience factor, just a simple hose of the solar panels should get them clean enough to improve efficiency. In the case of cleaning the solar panels require more than a hose (like for bird droppings and such), manually you may need to clean the solar panels with a brush and water. If possible do not use soap and soft water. Hard water (with a high mineral content) can eventually build up heavy deposits. Never try to climb out onto the array – use a soft brush with an extension pole. Boat cleaning brushes (around €30) are the best for cleaning. In view they offer flow-through handles which deliver water right to the bristles. At the same time, you do not need to worry about scratch for their design. If you need chemical cleaning, use a detergent that will not damage aluminium. Many domestic detergents can damage panel frames and clamps. How often should I clean solar panels? The last part is answered in two parts: one for tilted solar panels and one for flat solar panels. Tilted solar panels are able to benefit from Mother Nature’s natural cleaning due to the rain being able to get most of the dirt and grime off. Even though there might be some dirt collecting at the corner of the solar panel, the effect on the output is insignificant compared to the time you would have to spend cleaning it off. As for flat solar panels, even though there is a clear benefit for cleaning the solar panels, you have to do a time vs. benefit analysis to determine how often they should be cleaned. 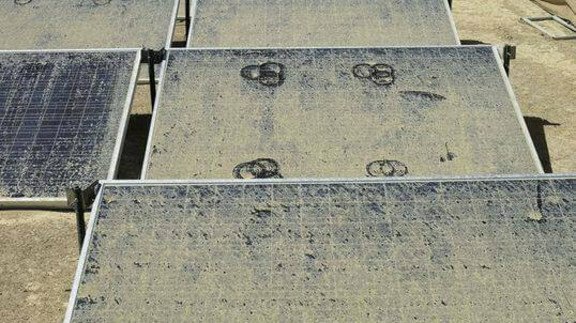 For areas that collect dirt easily on the solar panels, some wash around every other month. For areas with less dirt, you should wash the solar panels around 1-2 times a year. Ideally, you should wash your solar panels first thing in the morning when the panel is still cool. Cleaning them is definitely beneficial towards improving your energy output. As a rule of thumb, I usually tell clients that the same rain that has dirtied your car has also dirtied your panels. This is especially true when we have the occasional rain showers with soiling. You learn more? Feel free to contact us.